When it comes to memory foam mattresses, not all are created equal. For high quality and excellent value, the Dreamfoam Bedding Arctic Dreams 10-inch Cooling Gel Mattress tops the list. Not only is it made from superior high-density polyurethane foam, it has a three-inch top layer of cooling gel. This gel provides a cool, comfortable night’s sleep. And because of its ability to conform to the shape of your body and evenly distribute weight, this mattress provides a restful sleep for those suffering from back, shoulder, and neck pain. 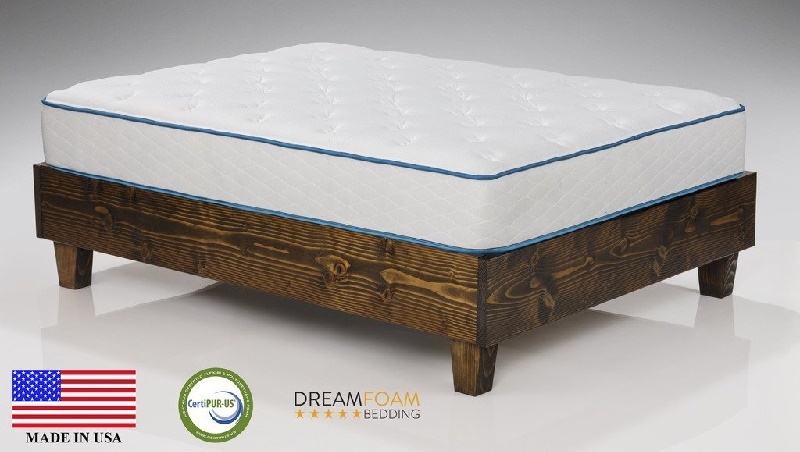 You can rest soundly on the Dreamfoam Bedding Arctic Dreams 10-inch Cooling Gel Mattress because it is made in the USA and adheres to very strict standards. It is also CertiPur-US certified, which means it is safe for you and your family because it does not contain any harmful chemicals such at mercury or formaldehyde. This makes the Arctic dreams mattress an eco-friendly choice as well. This mattress features a three-inch top layer of fast response Energex gel foam. Energex is made out of viscoelastic gel foam . The mattress also contains 6.25 inches of convoluted high-density polyurethane foam. The Arctic Dreams mattress comes in the following sizes: twin, twin XL, full, full XL, short queen, queen, king, and California king. It has a comfortable level of thickness at 10 inches, which includes a soft quilting layer along with the gel foam layer, and polyurethane foam layer. It is made in the USA and comes with a 10-year warranty that protects your investment against any factory defects. The Arctic Dreams mattress does not contain harmful chemicals such as flame retardants, mercury, lead, heavy metals, formaldehyde, chlorofluorocarbons, or phthalates. It is also considered a low VOC product. The gel-infused foam provides a cool and comfortable level of sleep, especially for those who tend to feel overheated in the night. The Energex gel foam quickly springs back to shape. It has a responsive polymer structure that is a much better alternative than latex or spring mattresses. This mattress rates a 6, or medium plush, on the comfort level. Like most memory foam mattresses, this one provides firm support and prevents sleep from being disturbed by a partner who tosses and turns in the night. Since this mattress is CertiPur-US certified, it is guaranteed to be free of chemicals and safe for your home and the environment. Because of its features and the high standards that come with a mattress that is made in the USA, this mattress is a good value for the price. The Arctic Dreams mattress is easily shipped straight to your front door because it uses the latest in compression technology for shipping. The Artic Dreams mattress has an initial odor that is strong. However, this dissipates fairly quickly once the mattress has been out of the packaging for a period of time. When the mattress first arrives in the box, it is questionable if it will rise to the level of 10 inches thick. Eventually, is does expand to the full 10 inches, but you may have to wait for 48 to 72 hours for it to be completely full. This mattress is best suited for people who prefer a very firm mattress. And because of the cooling gel, it is also a good fit for those who have a tendency to get overheated while sleeping. Those experiencing back pain or joint stiffness will find this mattress conforms well to the body and relieves pressure points. While the Arctic Dreams mattress is very comfortable for most people, it is not recommended for those weighing over 300 pounds. The Dreamfoam Bedding Arctic Dreams 10-Inch Cooling Gel Mattress is an overall great value for a mattress. Memory foam mattresses are some of the most popular types of mattresses on the market today and this one tops the list. With its cooling gel and medium plush level of firmness, it is easy to get a good night’s sleep. And you don’t have to worry about your partner disturbing your sleep with tossing and turning because the Arctic Dreams mattress is highly resistant to movement. Because it is made in the USA and is eco-friendly, you can sleep well knowing this mattress is safe for you and the environment.